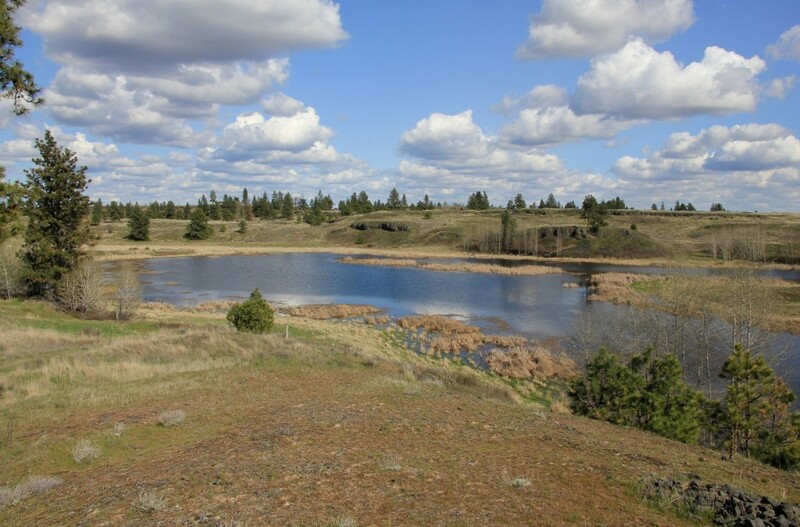 Pleasant springtime hike to an Eastern Washington scabland lake, waterfall, and historical farm. 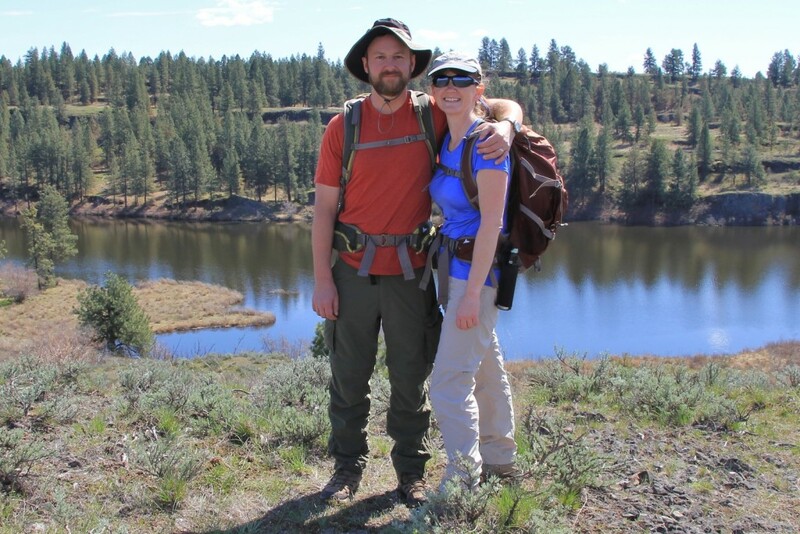 Hog Lake is an excellent springtime hike. 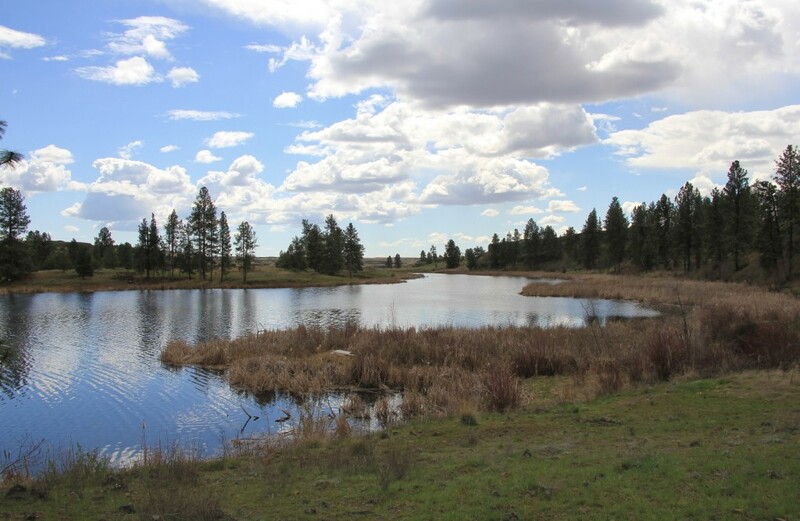 While the mountain trails of the Inland Northwest are still snow bound, the scabland lakes of Eastern Washington are at their best. 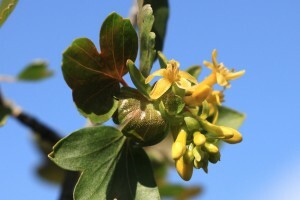 Temperatures are moderate, wildflowers are blooming, hillsides are starting to green up, and if you are lucky the ticks haven’t reached their peak. 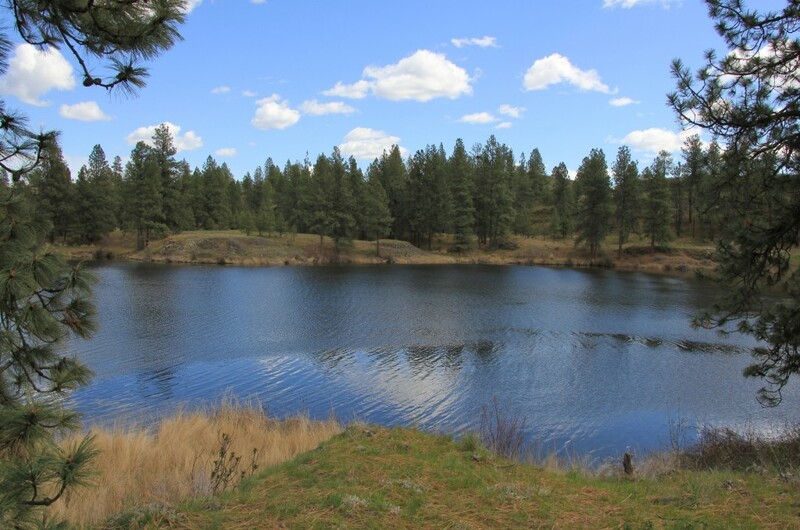 The terrain on this hike is typical of the area: small to moderate sized lakes, rolling fields, and ponderosa pines. 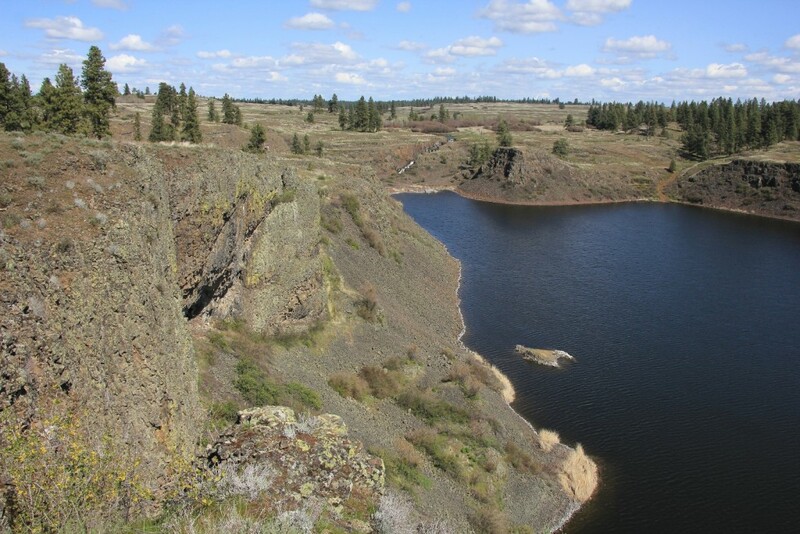 The Channeled Scablands of eastern Washington are coulees that were carved by the Great Missoula Floods after the last Ice Age. 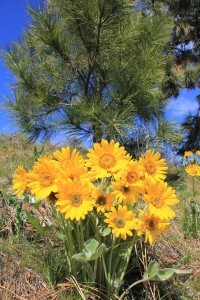 This particular area is managed by the BLM and is rich with wildlife, especially migratory birds. The first week of April 2015 was forecast for mid-50s and mostly sunny conditions—perfect! 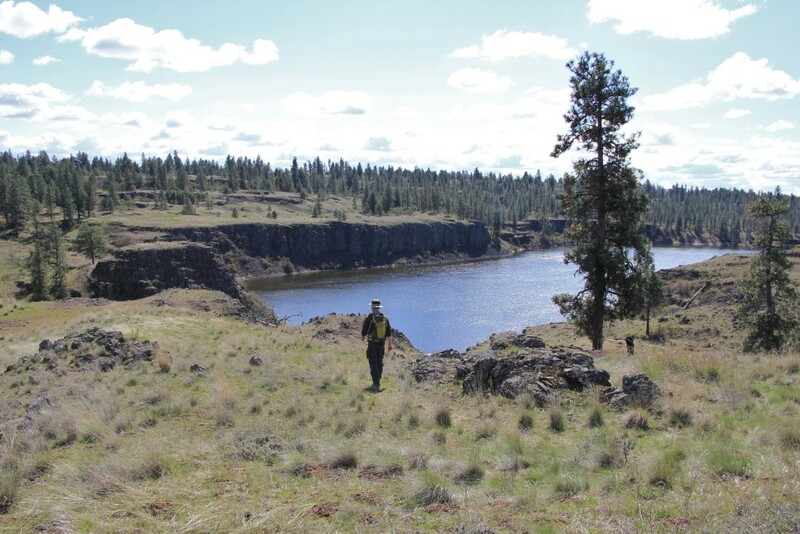 We easily found the large trailhead for Hog Lake which was just a few miles off I-90 west of Spokane. We started by entering through a hiker gate and hiking through forest. After roughly a quarter mile on good trail, we came to a split. I was guessing, but figured we should bare to the right to get the closest view of Hog Falls. It was a good guess and we soon came to an overlook of impressive Hog Falls. From the falls overlook, we dropped down to the lake shore and near the base of the falls. Here, the water disappears underground before draining into the lake—an interesting sight. A private property fence prevents access to the very base of the falls. Continuing, we made our way along the length of Hog Lake. Most of this stretch keeps you up high along towering cliffs with nice views of the lake. We saw five parties in the area including a small group on horseback. 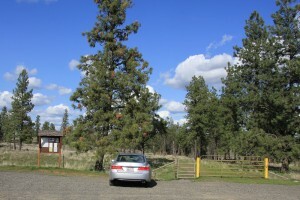 At the outlet of Hog Lake is a small boat launch and pit toilet (accessible by car). We stopped here for a short break and to utilize the facilities. From the outlet we walked a short distance up the road and then caught another trail that heads south toward Fishtrap Lake through Hog Creek Canyon. 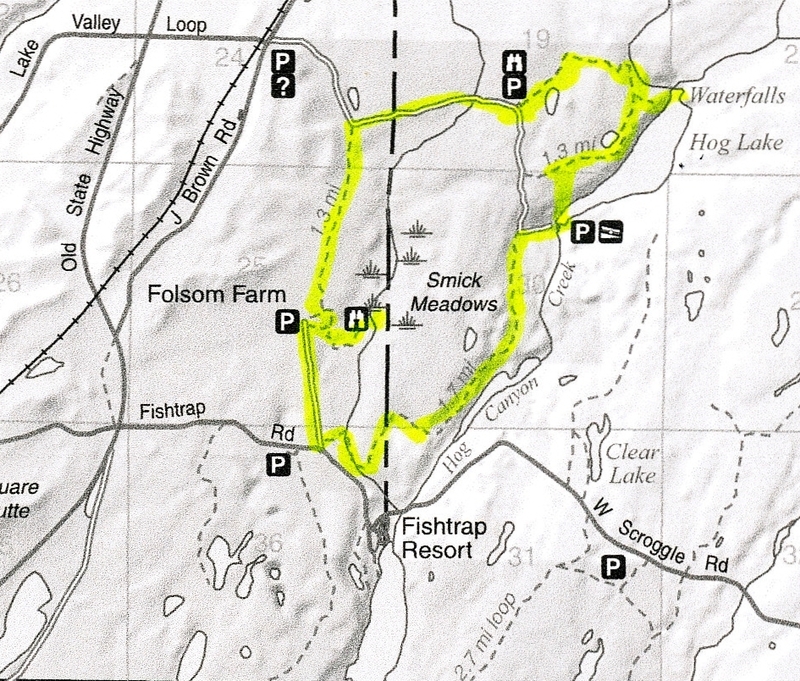 After roughly 1.5 miles the trail climbed and topped out near the Fishtrap Lake trailhead. 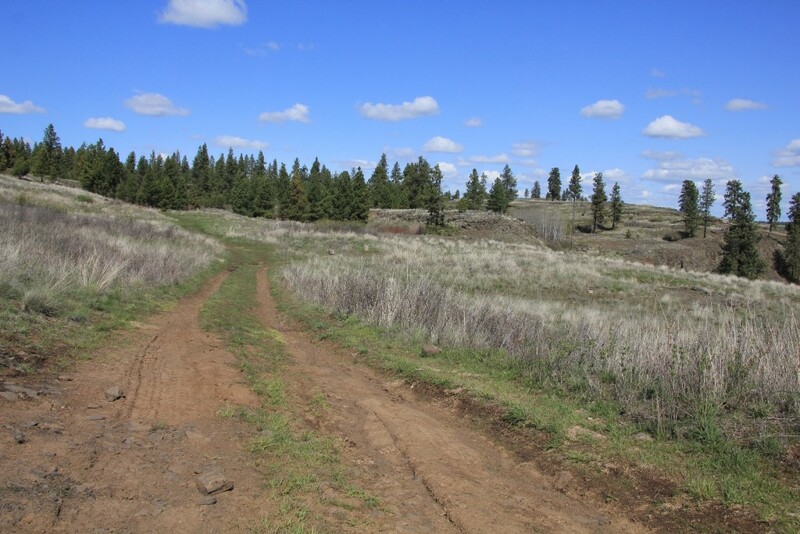 Here, we caught an old farmer’s road to the historic Folsom Farm which is now preserved on BLM land. 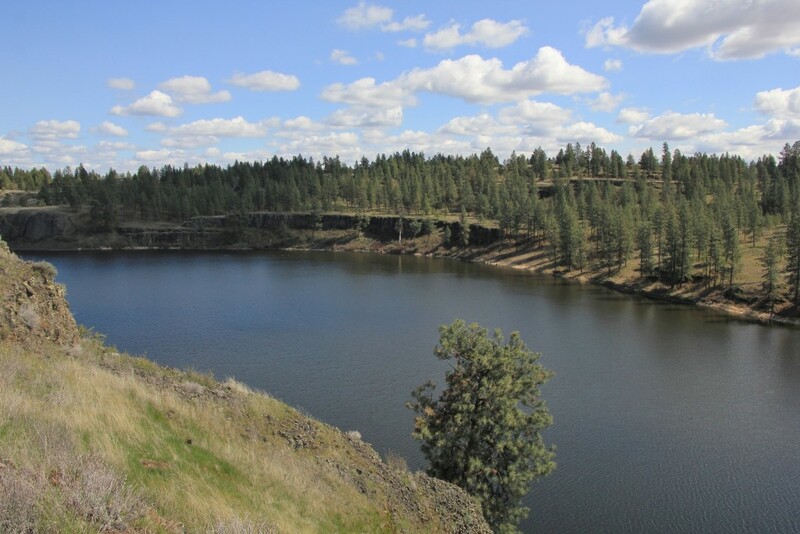 The Folsom family farmed this area from 1902-1910. Their farmhouse burned down during a wild land fire in 1998, but the big beautiful 1941 Smick barn was saved. 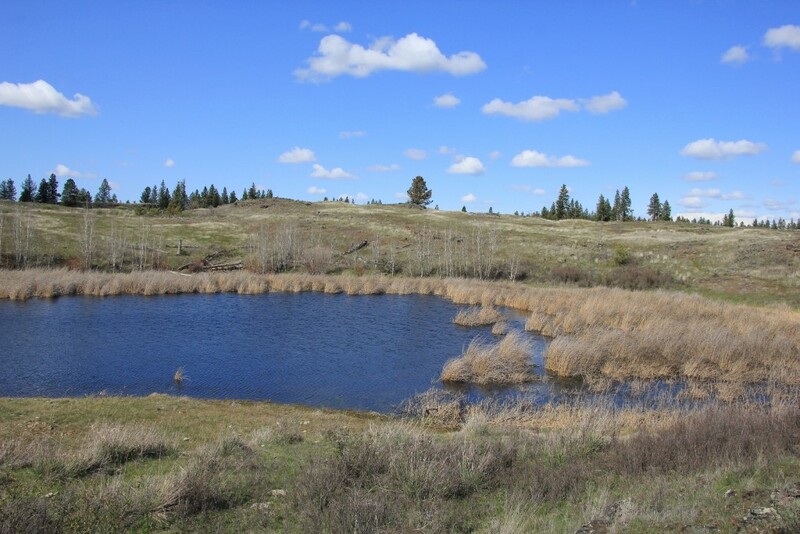 We hiked below the barn to Smick Meadows where we found turkey and many wetland birds. 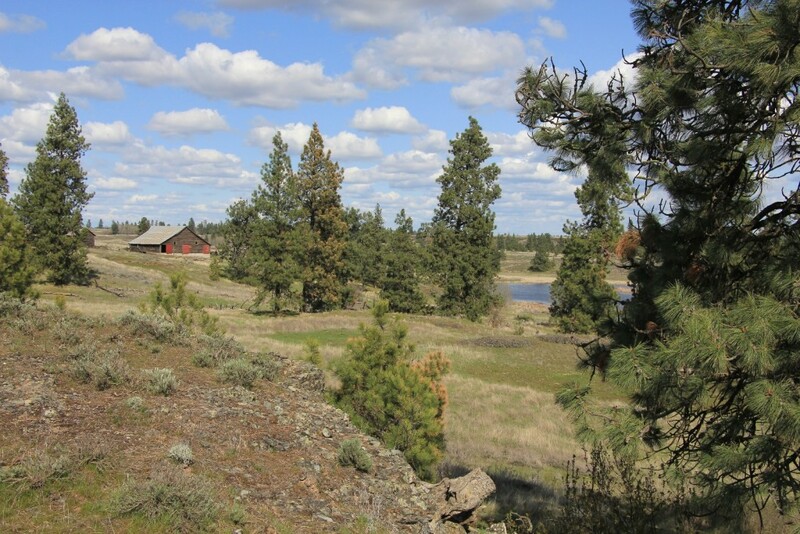 With the historical barn and spring bird activity this was a fun area to explore. From there we continue down an old gated off farm road which lead to the road we had driven in on. About a half mile road walk found us back at the car. 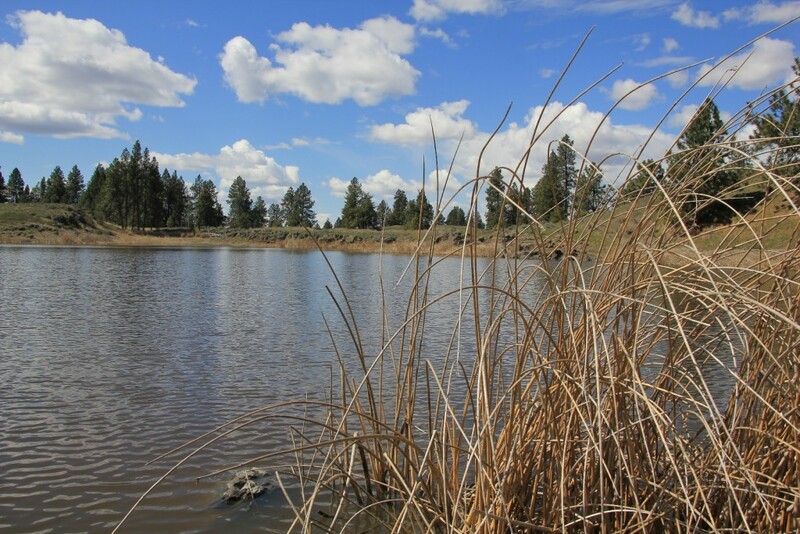 Those wishing to extend their hike can make a side trip over to Fishtrap Lake. 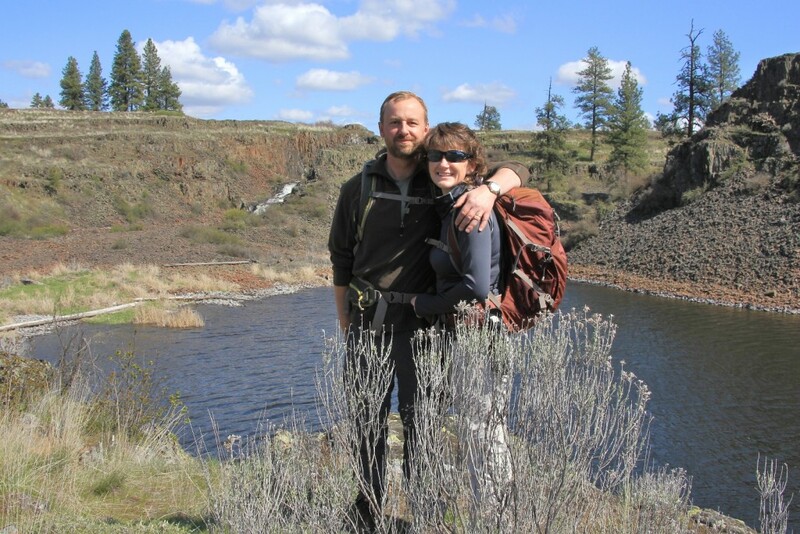 We did this hike exactly one year prior on a beautiful spring day. 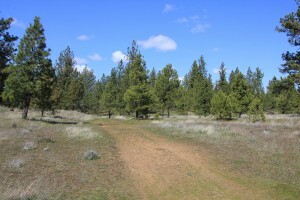 Following this trail to the southern tip of the lake at Farmers Landing and back will add an additional 6.6 miles round trip. Since we did this hike, a wild fire burned through the area. We returned in late fall 2015 and were disappointed with the scenic value compared to our first visit. 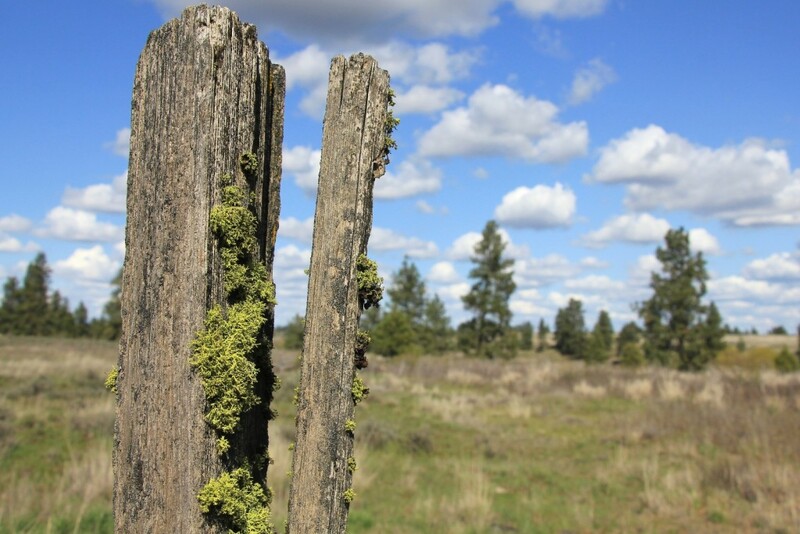 The native prairie will return quickly, but there was quite a bit of fire damage to the mature pine trees. 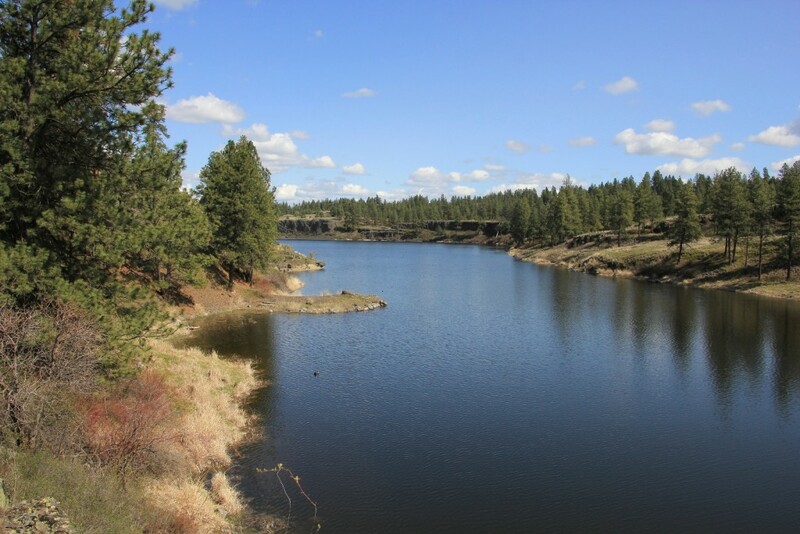 Directions to Hog Lake trailhead: From Spokane, Washington travel west on I-90. 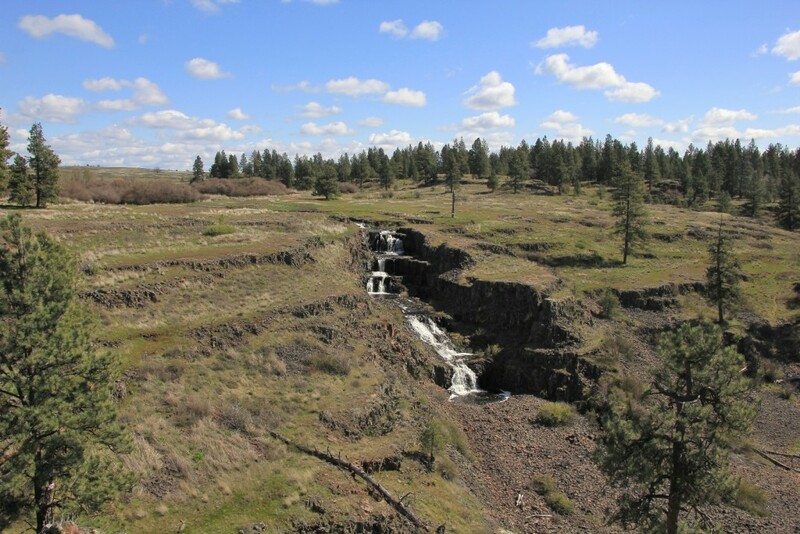 Take exit 254 signed for Fishtrap/Sprague Highway. 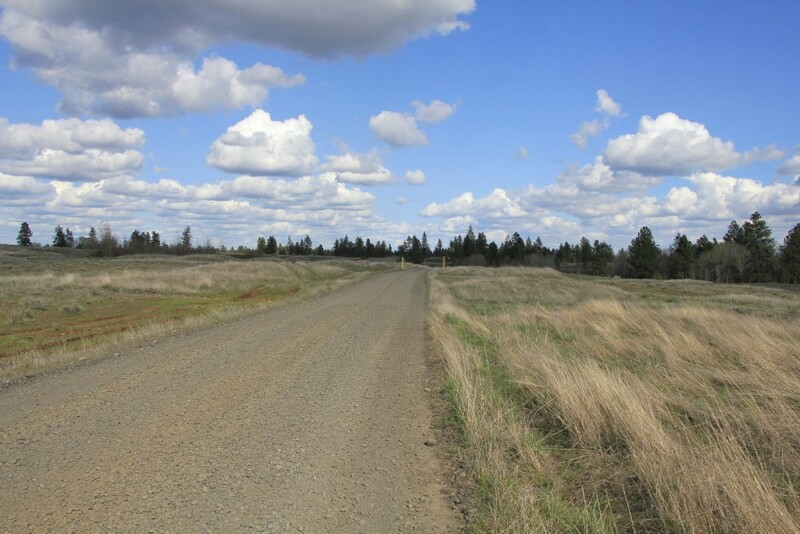 Turn south and travel 0.8 miles turning left onto the first gravel road which is located across from the road signed Lake Valley Loop. 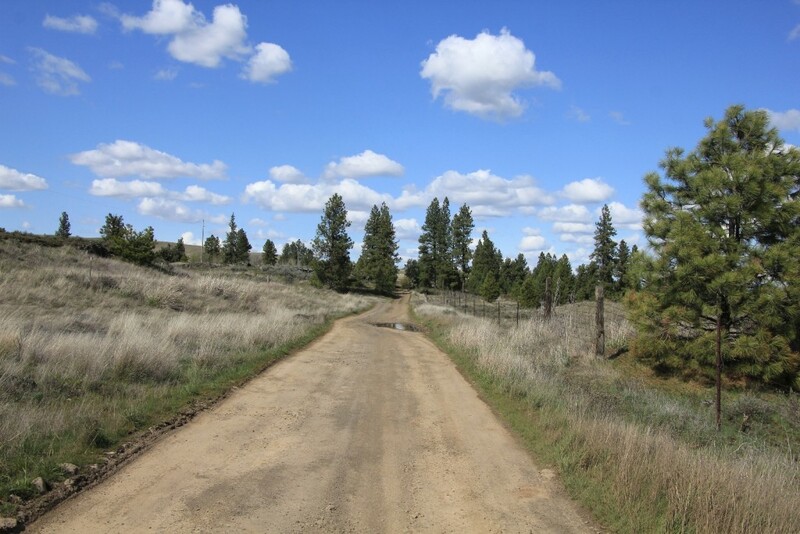 Drive 0.5 miles on good gravel road, cross Jack Brown Road, and enter BLM land at the cattle guard. Depending on the time of year, you may have to park here. I had read that the road is only open from December 1 – March 31, but the road was still open when we arrived the first week of April. 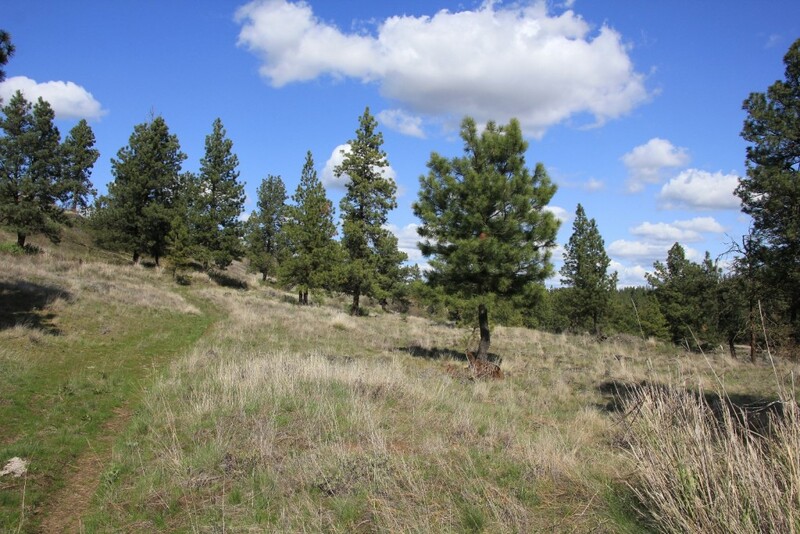 If the road is open, continue along the good gravel road approximately 0.5 miles to the large trailhead parking on the left at 2,274′ elevation.